A whole new look to your clock. In its simplest form, Zooper Widget offers a unique new set of designs for the clock on your Android Home and Lock screens. Under the hood, it has a great number of customization aspects to let you tweak to your desires. The thing is, unless you wish to switch back and forth between different designs, the free version is good enough. However, if you are an avid Tasker user, it is extremely well worth ponying up the couple dollars for the pro version. After you've played with Zooper Widget for a short time, you come to realize that a vast amount of system info is available to you. Although you probably don't care that you could have a constant reminder of your device's Internal Storage size or Android Release version number, your battery level and local weather are actually pretty handy. Even offering a few icon sets to add a nice graphical element. That's all fine and good, but the average user is now asking why they'd bother versus the other clock/weather widgets available. I offer no sales pitch to that regard, but if you have a heart for down and dirty customization, and a knack for Tasker tasks, please read on! The pro version allows you to add click events to elements of your design (it warns that this is a Beta feature, but I found it to be very solid.) These click events are pretty simple, choose from one of three categories: Zooper, App List, and Shortcuts. Zooper lets you control whether the click does nothing, goes into the widget settings (default action) or Force and update of the widget. App List is also very simple, it will launch the app that you choose. Shortcuts is a little better, pulling from the shortcuts available via the built-in Android Shortcuts widget, this allows you to access bookmarks, directions, music playlists and any other functionality that your other installed apps bring to the table, including Tasker Shortcuts. 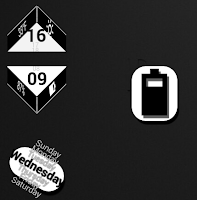 In the smattering of images above, you had noticed a few different designs and features, a mix of graphical and textual elements to make up the various clocks that I've played with, including progress bars used to represent the values, all of which have the click events in place to navigate you to the relevant battery info, clock app, wifi settings or weather forecasts. Those are all built-in click events, below is the main build I have going with Tasker events. Those that have seen this before know that it has been a long term work in progress in terms of design, it just isn't pretty enough, but the function is there. This entire design is based on the Google Augmented Reality game called Ingress. Click the # 4 to go to the clock app, click the power % to get to the battery info... now, when I click the speaker icon in the bottom right, I trigger a Tasker Task to re-adjust the system volume to about 70%, I call this game-volume. Similarly, if you click the blue background 'brighter' Ingress icon, just left of center, the screen brightness is increased to 30%, perfect for the average outdoor cloudy day. Click it again to get to 75% and again for 100%, for those bright sunny days. And when the sun sets, click the darker icon to return to the minimal screen brightness that I normally maintain. I used to have this built in as the fourth click on the brightness icon, but I found myself clicking too much to get there, so I split it out. Remember, GIMP is your friend for your image designs. In the end, Zooper takes on the style and life of each user, my creations have a similar look and feel, yours will be different. Just remember it will take some time to build your stuff, and you will likely go through a few evolutions of your design before you land on perfect, but you'll get there. Zooper Widget Free, or $1.99 Zooper Widget Pro in the Google Play Store.